Perhaps the oldest breed of horse in Britain is the Shetland Pony. Named after the islands where it originated, it is now one of the most popular ponies in the world. The little Shetland is probably so shaggy because it was conditioned by its environment. The Shetland Islands, lying off the northern coast of Scotland, are mostly barren and have a harsh climate. For many centuries the Shetland Pony lived in the open, protected from the elements only by its thick hair, long mane and forelocks. 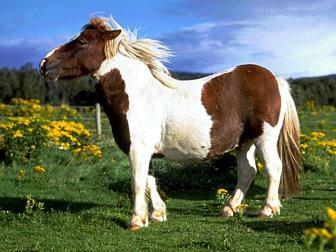 The Shetland islanders domesticated the ponies to do useful work for them. The pony carried peat down from the bogs to the cottages for use as fuel. The also hauled seawood up from the shore to the fields to be used as fertilizer. The Shetland is probably the strongest equine relative to its size, yet even the stallions are gentle and docile. The body of the British Shetland is full with short, muscular legs. It has substantial mane, forelock and tail. Coloring varies by season. Many colors are seen in this breed, the most common being black and dark brown. Shetlands are now mostly pets, but compete in weight-pulling events, are shown in halter classes and put to small vehicles for driving. It stands on an average of 9.3 hands and does not exceed 10.2 hands. The Shetland Pony's ultimate origin goes back to Equids -- larger than the modern breed -- which lived in the Shetland Islands as early as the Bronze Age. When Norsemen invaded the islands, they brought ponies with them which were ancestors of the modern Dole Pony. These ponies crossed with native stock which created the Shetland Pony similar to that known today. The Shetland Pony is recognized as the strongest Equid relative to size in existence. Therefore, when the coal mining industry became extensively developed in Britain in the 1800s, Shetlands were imported in great numbers to haul coal cars in the "pits." Many of these ponies were born and died in the mines. Some literally never saw the light of day. Many Shetlands were subsequently exported to America to work in coal mines. Mechanization rendered the Shetland inefficient in coal mines by the mid-1900s. In the coal-rich American Mid-West, Draft Shetlands are still common and compete in weight-pulling contests at the county fairs similar to those in which heavy draft horses compete.